Step 2: Print and fill out the downloadable form. *To be awarded in the form of a pre-paid debit card. OFFER AVAILABLE WHILE SUPPLIES LAST. LIMIT 5 Kellogg’s™ Gas Rewards Cards PER HOUSEHOLD. We must have your ZIP Code to mail order. U.S. Military overseas send APO or FPO address. 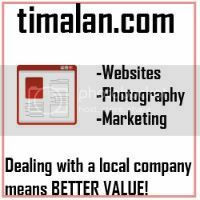 This offer good in U.S., its territories and Puerto Rico, except where prohibited, licensed, restricted, or taxed. Kellogg Company reserves the right to substitute or limit offer. Excess UPCs will not be returned. No mechanical reproduction of Official Order Form will be accepted. Resale of Kellogg premium or Official Order Forms is prohibited. Neither this offer nor the Official Order Form may be published, posted or otherwise displayed and/or offered for sale in any electronic or other venue without Kellogg Company’s express written permission. Kellogg is not responsible for lost, late, illegible or incomplete orders or postage-due, damaged or separated mail. Additional postage may be required. Promotion ends on 12/31/2011; letters must be postmarked by 12/31/2011 and received by 1/07/2012. FREE 7 ISSUES OF PARENTS MAGAZINE! clickty click! *Walgreens registers will add up your total Mars purchase and subtract your total Mars coupons. That means you can get 7 eggs at $.29 each = $2.03 – or $.03 after using two coupons. NOTE: in past weeks, the $5 RR was only valid on future Hershey/Cadbury purchases. 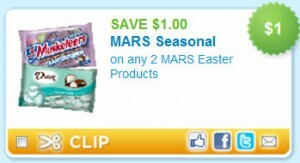 *Use your $2/2 Mars coupon from the April ALL YOU magazine if you haven’t already and get these for a buck! "From project basics to giving your child the opportunity to say, "I built it! ", our Build and Grow kid's clinics are a great way to help build confidence! Bring the kids into any Lowe's store and build a FREE wooden project. Each participant also receives a free apron, goggles, a project themed patch, and a certification of merit upon completion of their project." Wireless Printer Scanner Copy Fax All in One Machine by Espon Cheap on Amazon! = as low as .24 cents for mascara or .49 cents for the single eye shadows depending on price at your store. you will need to login or sign up for Murph e-Offers then click the link "view and print coupon". they also send usually 1 coupon a month to your email. sometimes its for free pop/soda, candy, gas, ect. before you head out shopping this weekend be sure to check the list and see if you plan on stopping by any of these stores to score a even better deal. Walgreens - Various Coupons in the April Coupon Book (found in-store). 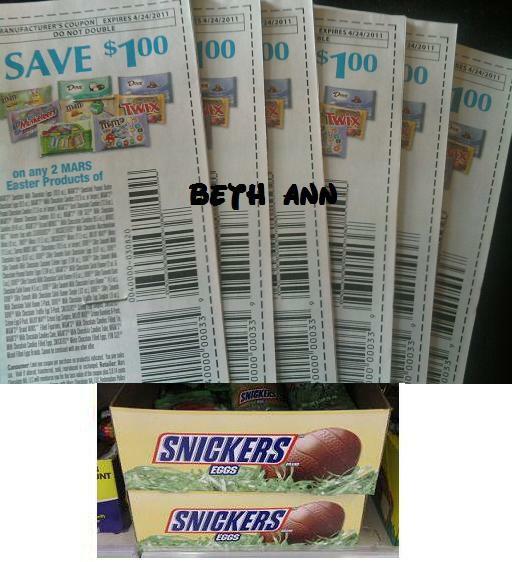 Heinz Vinegar & Snickers Easter Singles -UPDATE cheaper this week at Walgreens!!! well this week 4/10-4/16 walgreens has it on sale for .99cents with in ad q.
so whose ready to dye your easter eggs!!! 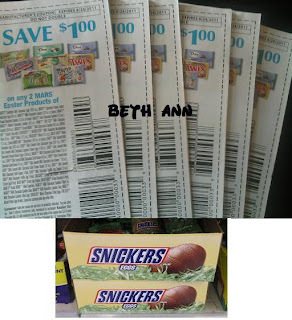 Mars Seasonal Singles (like the snickers above) are regular price 2/$1.00, so 2 for FREE after this coupon! plus they often go on sale.. next week 4/10-4/16 they are .29cents its a .42cent money maker so be sure to have a "filler" item to use your overage towards.! get a Free sample of Shobha® Rosewater Calming Gel IT soothes skin with a unique cooling effect, combating redness with its ‘rosy’ superpowers. Get yours today! Home Depot Spring "black friday" Sale! FREE SAMPLE OF PLAYTEX SPORT TAMPONS & COUPON! Biore Skincare. another facebook freebie!